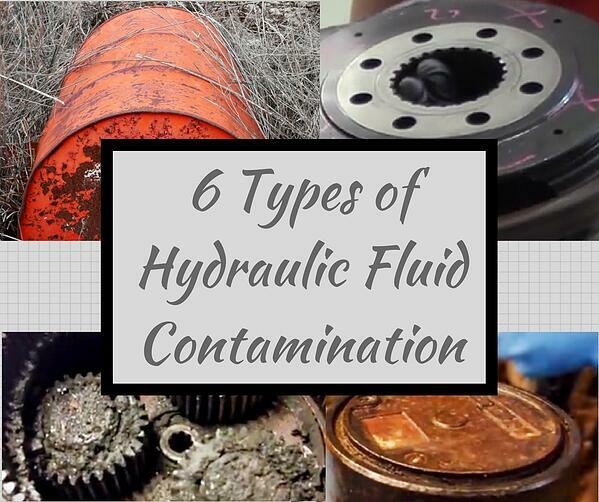 Since contamination is anything that doesn’t belong in the hydraulic fluid, all of these examples would be considered hydraulic contamination. They can affect the efficiency of your machine. Built-in contamination is why some experts recommend that you flush your hydraulic system when installing new components or when a machine has recently undergone an overhaul. Aside from flushing the system, filters are the best way to keep built-in contamination under control. As your hydraulic equipment runs, it will generate contamination. Generated contamination includes very fine metal particles that look like dust. These particles result from metal-to-metal contact (especially during a component’s break-in period). Over time, the size of the particles may get bigger, such as a chip from the surface of a ball bearing, a small chunk that breaks loose from a gear tooth. Generated contamination could also include particles of rubber or polymer seals that are wearing out. Over time, generated contamination will affect the efficiency and productivity of your hydraulic components. And every bit of generated contamination is likely to produce even more contamination in a dangerous domino effect. This type of contamination is unavoidable but can be kept under control by the proper use of filters. Does your hydraulic fluid look foamy? If so, it may be contaminated with air, and air is not good for your hydraulic fluid. If air gets trapped in your hydraulic fluid, it will affect its compressibility. Enough air contamination can affect the efficiency of your machine, including the torque from your final drive and the cycle time for your attachments. The key to minimizing air contamination is simple: don’t unnecessarily expose your hydraulic system to air, and don’t leave your hydraulic fluid storage containers open unnecessarily. Water can also pose a problem for your hydraulic fluid. It affects compressibility and can cause corrosion issues. It also impairs the ability of the hydraulic fluid to act as a lubricant and lead to the formation of sludge. Water-contaminated hydraulic fluid can also lead to cavitation in the pump on your machine -- and we know how expense pump repairs and replacements can be. If your fluid looks milky, then it is probably contaminated with water. Don't leave your hydraulic fluid open and exposed to the atmosphere where it can absorb moisture. 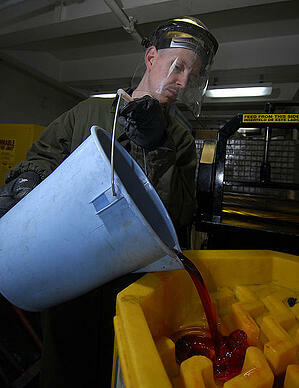 Unused hydraulic fluid should always be kept in sealed containers. Another common type of hydraulic contamination is chemical. One of the primary causes of chemical contamination is the natural degradation of the hydraulic fluid. Over time, the chemicals that make up the fluid break down into components, and those components aren’t always good for your system. Excessive heat can speed up this process. If two different hydraulic fluids are mixed together, and their additives are not compatible, chemical reactions can occur that also result in chemical contamination. This is one of the main reasons why you shouldn't mix different types of hydraulic fluid. Als, keep in mind that hydraulic fluid has a finite useful life and will degrade with both time and age. Change it out according to manufacturer guidelines. Ingressed particulate contamination is a fancy word for particles that have made their way into your hydraulic system from the outside, as opposed to generated contamination. Ingressed contamination can include dust, mud, dirt, and sand. It usually gets inside your hydraulic system when it is opened for repair or maintenance or through leaking seals. This is why we encourage machine owners never to neglect leaking seals. If fluids can leak out, contamination can get in. To prevent this type of contamination, try to avoid opening up your hydraulic system in anything but a clean environment. Also, clean off the equipment before opening it up so nothing falls inside the hydraulic system. Contaminated hydraulic fluid is a serious issue for your equipment. It can reduce efficiency, increase cycle time, lead to damage, and eventually catastrophic failure. The effects of contamination can be costly to repair if they can be repaired at all. Make sure to check and change your filters regularly and avoid introducing contamination into your system.